Decorating eggs for Easter is a tradition I never miss. Every year I decorate eggs by cooking them in onion skin following my granny’s recipe. The pigment from onion gives the eggs a very nice red-brownish colour. 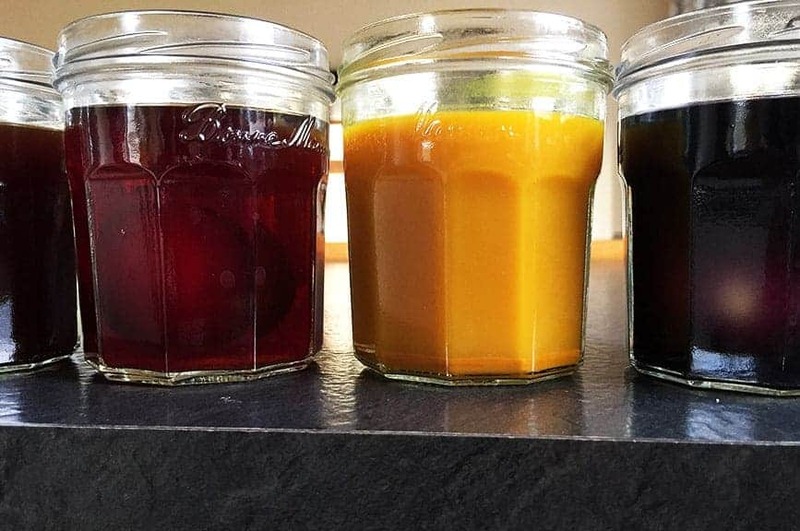 On top of my onion skins dyes, I decided to experiment with some other natural dyes this year. 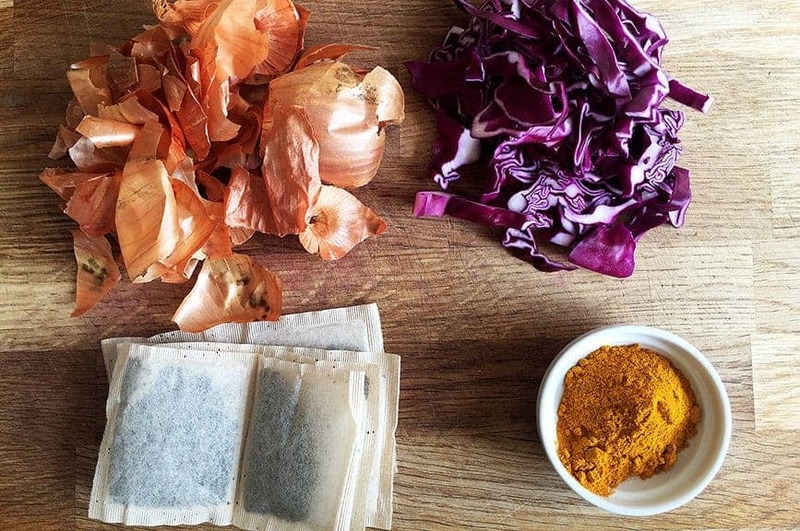 The ingredients I selected were turmeric, normal tea, red cabbage and onion skin (as it always gives me an excellent result). I knew that eggs cooked in onion skin for 20 minutes would absorb enough pigment, so the first thing I wanted to try was if the other ingredients would give me the same result. I used half a red cabbage, cut into pieces, 8 tea bags, 2 tablespoons of turmeric and 3 hand fulls of onion skin. I cooked each ingredient in a separate pot for 10 – 15 minutes before adding eggs. Then I turned the temperature down, added an egg to each pot, and let them simmer on medium heat for almost 30 minutes. Except for the egg cooked in onion skin, the result was disappointing. Neither turmeric, cabbage nor the tea gave the eggs enough colour. 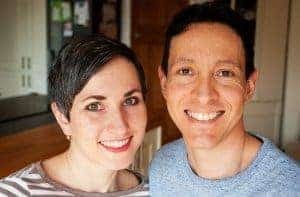 The 30-minute cooking method didn’t work as the eggs were very pale and unattractive and all were over boiled so I had to bin them. I didn’t want to give up as easily. 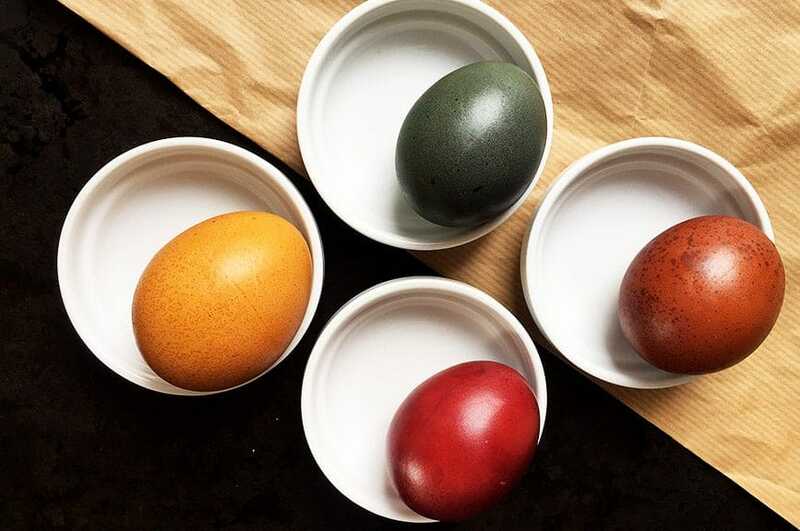 Another method I tried was to leave cooked eggs in the dyes overnight which allows the pigment more time to be absorbed into the shells without over boiling eggs. The second time my experiment was a success and I am happy to share the method with you. Make your dye solutions by cooking each ingredient in a separate pot for around 15- 20 minutes. 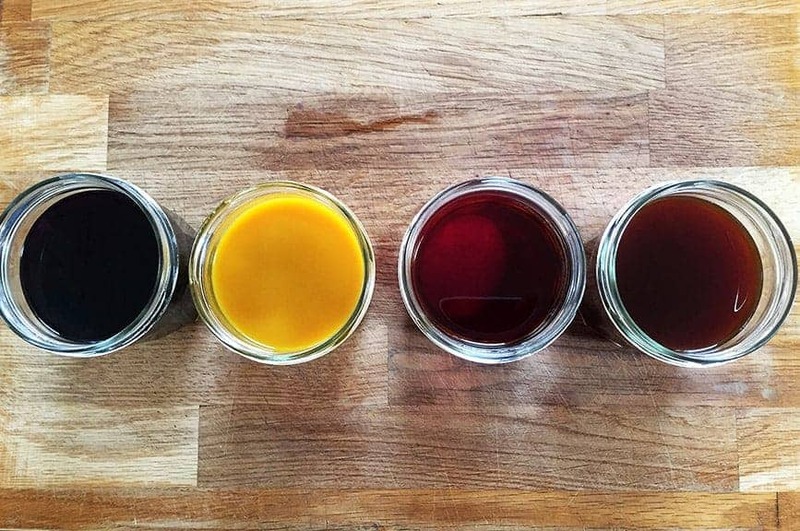 Strain the liquid and poured it into 4 jars – one for each colour. Wait for the liquid to cool down. Add a teaspoon of vinegar into each jar and insert eggs in – one into each dye. (If you use bigger jars and make more of dye solution you can certainly fit more eggs in). 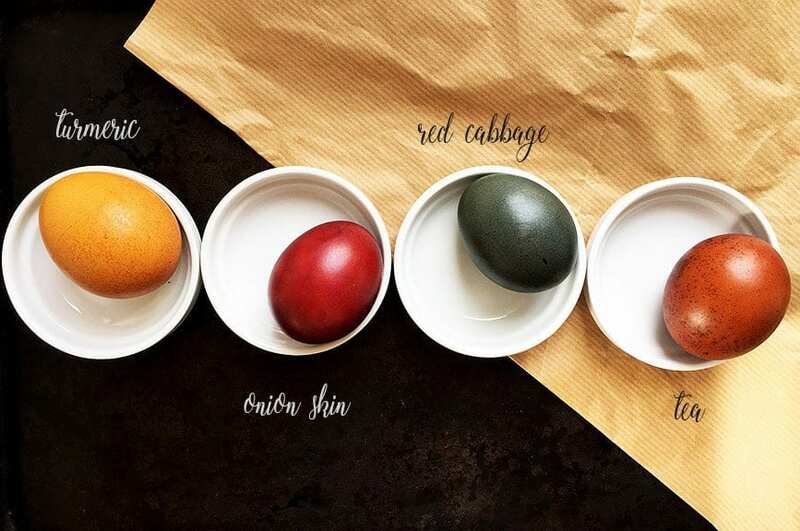 Leave the eggs in the dyes for at least 12 hours. Store the jars with eggs in the fridge if you want to eat them later. Using this method the eggshells absorbed pigment nicely and the colours were much brighter, deeper and more vibrant. Of course, they will never be as bright as manmade food colourings but I was very impressed with them. 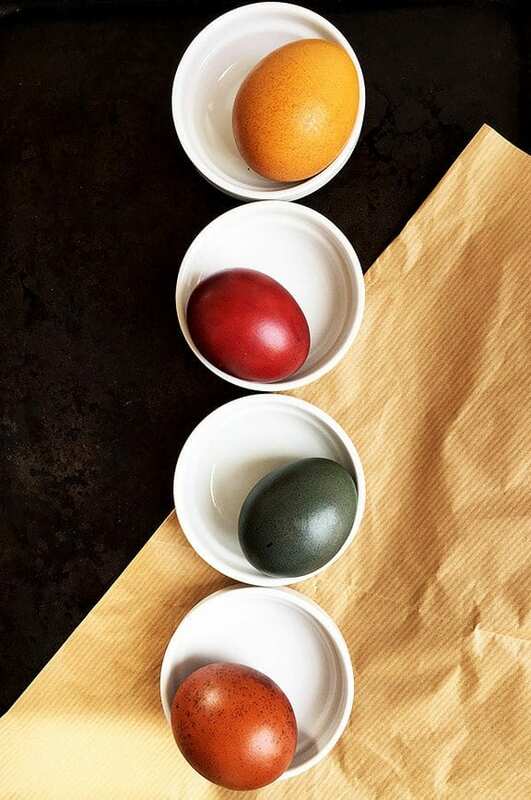 The last step was to gently coat eggs with either oil or lard as it prevents colours to go dull once the eggs are dry. I did it very gently in the palm of my hand as the colours are fresh and fragile at this point and it’s easy to scratch them or rub them off by an accident. I would like to experiments with some other natural dyes like henna, indigo, coffee, beetroot, red wine etc. but preferably next year, as I really don’t want to eat more cooked eggs anytime soon.